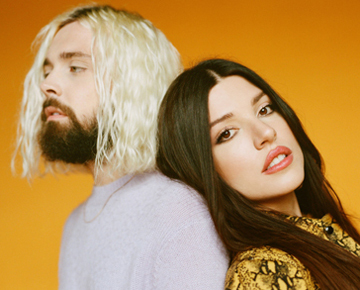 Flora Cash Interview - Writing Their Hit "You're Somebody Else"
The success this year of alt-pop duo Flora Cash could only have happened in this digital age. Six years after they met commenting on each other’s tunes on SoundCloud, Minneapolis native Cole Randall and Swedish-born Shpresa Lleshaj’s “You’re Somebody Else” is a hit on several platforms, reaching Top 10 on Billboard’s Alternative Songs and Adult Alternative Songs chart. The single also made the Top 15 on Billboard’s Hot Rock Songs chart. The track has surpassed 15 million streams on Spotify and the lyric video on YouTube has over 11 million views. In its first 10 days, the duo’s official video—which includes poignant clips of fans relating how the song has impacted them personally—scored over more than 335,000 additional views. The song is also a Top 5 at Triple A Radio and is quickly climbing at Alternative Radio. Now based in Sweden, the duo—who married in 2013—recently performed “You’re Somebody Else” on The Late Late Show with James Corden and Last Call With Carson Daly, along with their song “Roses on Your Dress.” Both tunes are from their second album Nothing Lasts Forever (And It’s Fine), which they released in the spring of 2017. Prior to their breakthrough in America, their 2016 debut album Can Summer Love Last Forever, released on the Swedish label Icons Creating Evil Art, earned them nominations for two GAFFA Awards from Danish music magazine Gaffa, as Swedish Artist of the Year and Swedish Newcomer of the Year. They recently signed to RCA Records for their next single “They Own This Town” and an upcoming album. “You’re Somebody Else” came to Randall and Lleshaj one night when they were staying at her sister’s apartment in Stockholm. “She and her fiancé had gone on a trip to New York and asked if we would like to stay at their place for a change of scenery,” Randall recalls. “It was nighttime and we lit a candle in the kitchen. We had not planned to write anything, but the guitar riff came to me and we started voicing these chords. We didn’t realize they were the most common pop progression until we started producing it later. All that development traces back to the moment when Randall’s music caught the attention of Lleshaj, who stumbled upon his SoundCloud account and started leaving comments under the songs. Subsequent Facebook messages gave way to an introductory phone conversation, which snowballed into marathon Skype sessions, which eventually led to Randall relocating to Sweden and the duo recording their debut EP Mighty Fine and ultimately getting married. The dreamy mystique of the music they create offsets the deep passion for life and music at the foundation of their union. The duo stitched together a singular style from threads of personal anxiety, struggle and ultimately triumph. Long before “You’re Somebody Else” became a viral and radio hit, they were receiving critical acclaim from indie tastemakers for Nothing Lasts Forever (And It’s Fine).